Teeth whitening is a popular treatment that can power away stains located deep inside the dentin and enamel of the teeth. 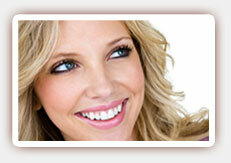 Whitening products are available both over the counter and in our dental office. Our West Hollywood cosmetic dentist works with our patients to determine the best and safest teeth whitening options that will provide them with the results they want. At-home kits like those you can purchase at the neighborhood drug store generally contain a 10 percent peroxide solution. This is strong enough to remove some of the stains on your teeth over a period of a few weeks. Unfortunately, it is also strong enough to irritate your gums, and if overused, it can even increase your risk of tooth sensitivity. Similar to some over-the-counter whitening kits, take-home kits use a tray to apply the bleaching solution. However, our dentist uses trays that are shaped to the unique contours of your mouth, which minimizes the risk of contact with your gums. We also use a more powerful bleaching solution in order to provide you with more dramatic results in less time. The fastest of all whitening treatments, in-office whitening can leave your teeth from eight to 10 shades whiter in just about an hour. This procedure is often the safest because it is directly supervised by our dentist and can eliminate the risk of contact between the bleaching gel and your gums. Contact our West Hollywood teeth whitening specialist today to learn more about your options or to schedule a consultation.